David Soren, a Regents' Professor of Anthropology at the University of Arizona, has spent more than 30 years working in the Italian region of Umbria, overseeing archaeological excavations, museum projects and the UA's largest study abroad program, Arizona in Orvieto. Much of his work has taken place in the small town of Lugnano in Teverina, where the community has become so endeared to Soren that the local government led an effort to bestow honorary Italian citizenship upon him in 1990 for his contributions to Italian archaeology. Now comes another unique Italian honor for the beloved UA faculty member: A new strain of olive, grown in Umbria, will bear his name. The Soren Olive is currently being cultivated by farmers and is expected to be marketed internationally sometime in the next three to five years. Soren learned of the honor during a recent trip to Italy, when it was formally announced at a luncheon with community leaders. Among the attendees was Umbria's minister of finance, who presented Soren with a plaque commemorating the naming. "In Umbria, they are noted for their produce. It's an agricultural state, so they were developing a new strain of olive, and I've been working in the area for so many years they decided to honor me with it," said Soren, also a UA professor of religious studies and classics. Located in central Italy, Umbria is one of the world's major centers for olive production, making the olive naming especially significant. It's also a heartwarming honor for Soren, who has come to know Lugnano and its surrounding communities and residents well. "As you live and work over there in these small agricultural communities, the people are just incredibly wonderful, and that's one of the main reasons I keep doing it, because I want to help them," he said. Soren says families in Lugnano, which has a population of about 1,600, often recognize him and come up to him on the street to say hello. And when he visits local restaurants, he's greeted with a jovial "Professore!" by staff who know who he is, where he'll want to sit and what he'll order. Soren first started working in Umbria in 1987, after being invited there by a local cultural association that had heard in the media about his work on the Mediterranean island of Cyprus, where he was studying ancient earthquakes at the time. "They wrote and said, 'On your way home, stop and see us.' And that's how it all started," he said. While Soren himself is admittedly not an olive connoisseur — though he does like olive oil — the significance of the naming is not lost on him. "It is a great honor because they think agriculturally in Umbria," he said. Soren, who has been at the UA since 1982, typically makes one or two trips to Italy a year. During the academic year in Tucson, he teaches in the UA's School of Anthropology in the College of Social and Behavioral Sciences, as well as the Department of Religious Studies and Classics in the College of Humanities. 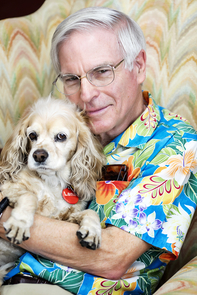 He's a favorite among students, as is his ever-present canine companion Lana, an 8-year-old cocker spaniel whose long lashes inspired Soren to name her after legendary film actress Lana Turner. In addition to the regular UA classes Soren teaches — which this semester include a course on Roman architecture and one on "art and the classical ideal" — he also teaches humanities classes to Tucson community members as part of the Humanities Seminars Program, offered through the College of Humanities. His work with that program recently earned him, along with UA faculty members Tom Miller and Leslie Tolbert, the program's Superior Teaching Award. Soren also recently learned that he will receive the Excellence in Undergraduate Teaching Award from the Archaeological Institute of America. The national honor, which recognizes excellence in the teaching of archaeology, will be presented in Boston in January. As if those accolades weren't enough, Soren has additionally received word that his latest book, "Art, Cinema and Popular Culture," has been accepted for publication. The textbook, a 400-page, illustrated collection of lectures he has given throughout his career, is due out early next year. Soren is humbled by the recent wave of recognition. "I've been doing what I do for 45 years," he said. "You go along for years and nothing happens, but this was all quite a surprise."